The DOTX441 dissolved oxygen analyzer is supplied in a compact cast aluminum case. SAE 323, with low oxidation grade, anticorrosion treatment and finished with electrostatic epoxy paint. The DOTX441 is compact, light weight, rugged and IP-68 rated. The units include local display, transmitter output and controller function all programmed via a 3-button side panel with an easy self guided menu. 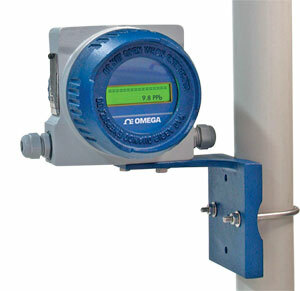 The DOTX441 can be mounted on a 51 mm (2") tube or flat surface. Electrical connections are on the terminal bar located in the back housing of the instrument with cable entrance through two cable compression fittings of 13 mm (½") BSP. Common applications include food and drink, pulp and paper, chemical, sanitation, water and wastewater treatments. 참고: Comes complete with 304 SS clamps with nuts and bolts for mounting, and operator’s manual. Sensor sold separately.